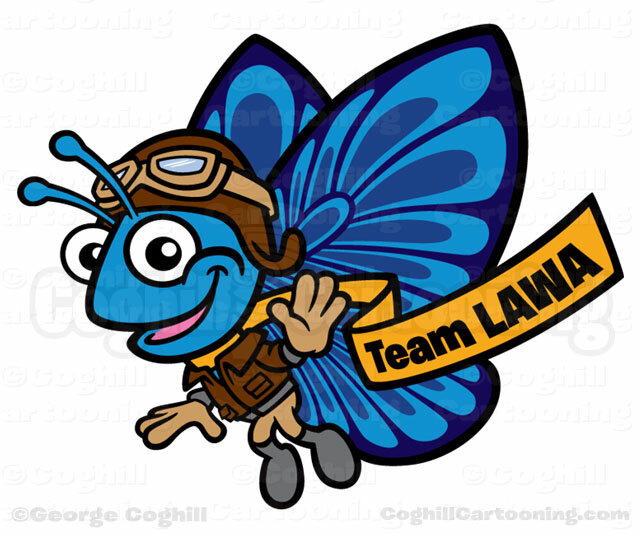 This aviator butterfly custom cartoon character mascot illustration was created for the Los Angeles World Airports (LAWA) Community Relations Division employee volunteer program. The mascot was to be a blue butterfly character based on the El Segundo Blue Butterfly which is native to the area and a part of the environmental mission of the organization. They loved my aviator bird cartoon logo and wanted something along the same lines — wearing goggles, hat, and a scarf with the words “Team LAWA” on it. The final art very closely resembles the initial sketch, and the biggest challenge was making a pattern for the wings that wasn’t too busy or detailed and looked like a butterfly pattern that resembled the actual butterfly itself.